What is it about noodles (or pasta) that is so satisfying? That the thought of it immediately makes you hungry and even when your stomach warns, I’m getting full, you continue to eat anyway? Maybe I should only speak for myself? I’ll happily eat noodles or pasta for days, especially if I prepare the dishes myself. I tend to load up my versions with vegetables to make them more nutritious. 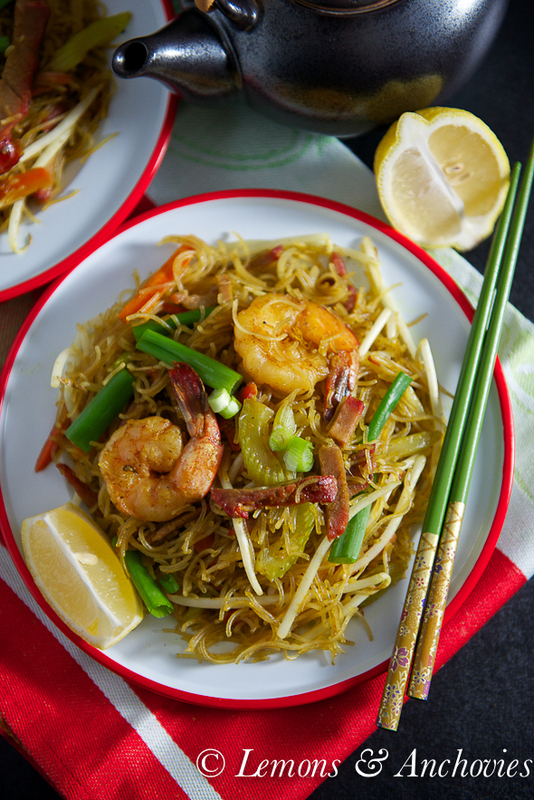 This Pancit Bihon is convenient for whenever I need a noodle fix but since I’d never tasted Singapore noodles until just a few years ago, I had no idea how similar the latter was to its Filipino cousin. 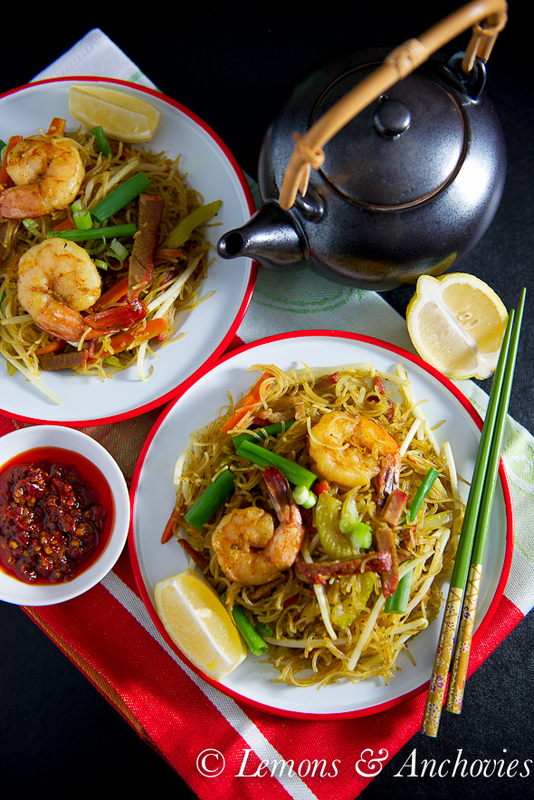 Contrary to what the name suggests Singapore Noodles do not originate from their namesake country. The dish was most likely a Chinese creation and is apparently more popular in Hong Kong and the U.S. The cornerstone of the dish is curry powder but there seems to be some flexibility in the protein and vegetables used. Looking at several recipes online (and at my favorite Chinese cookbook) I found no reason not to try it at home. I borrowed Grace Young’s soy sauce mixture and used Madras curry as recommended but since it’s so similar to Filipino pancit bihon and since I’m such a proponent of the absorption method of preparing rice noodles, I made Singapore Noodles my way (hopefully) without challenging the integrity of the original dish. This is essentially a quick stir-fry dish. You take some vegetables and some meat, typically Chinese barbecue pork and shrimp, add some curry powder then the noodles. It’s very easy if you prep the ingredients ahead of time. My biggest suggestion is to soften the noodles in stock to build more flavor in the dish. It’s how I learned to prepare noodles from my mother; it works. The recipe below is detailed but easy to follow. All you need to do to prepare the noodles is to bring a few cups of stock to a boil, turn off the heat and add the noodles. In 5-6 minutes the noodles will be soft and ready to use. The remaining liquid doesn’t go to waste as it is added to the dish. The rest is just cooking the vegetables and meat. What you get is a dish that takes minutes to cook but is loaded with flavor. And if you love noodles like I do, this will hit the spot, guaranteed. Note: This recipe works well as a vegetarian option. Use vegetable stock and omit the meat. I’ve done this and it’s still quite flavorful and satisfying. 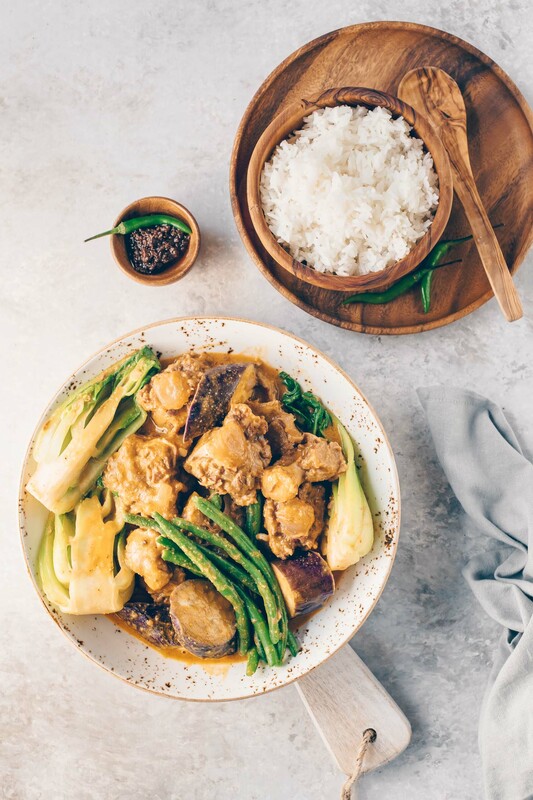 This popular Chinese restaurant dish is very easy to prepare at home. 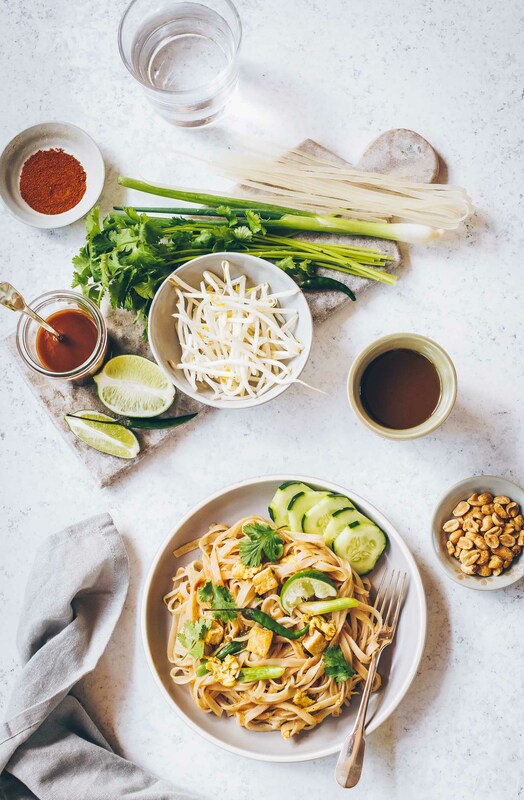 The absorption method of preparing the rice noodles is guaranteed to build more flavor. Can easily be made vegetarian. Combine the soy sauce, rice wine vinegar, sugar and salt in a bowl and set aside. To prepare the noodles, bring the stock to a boil in a medium saucepan. Add the noodles and turn off the heat. Don't break the noodles apart to fit into the pan. They will begin to soften as soon as you add them to the stock. Within 5-6 minutes the noodles will be soft enough to use. Because you'll be using the remaining stock (you should have about ¾ - 1 cup left), drain the noodles on a strainer over a bowl to save the unabsorbed stock. Set aside. While you wait for the noodles to soften, start cooking the meat and vegetables. In a wok or skillet large enough to accommodate the noodles (I used a well-seasoned cast iron skillet) add 1 tablespoon of the oil and heat to medium-high. Add the raw shrimp and cook for a minute or two on each side. You can also add the barbecue pork halfway through the cooking time just to heat up the meat if it's cold (mine came from the refrigerator). Remove the cooked shrimp and heated pork from the skillet and set aside. If the pan needs more oil, add the remaining 1 tablespoon oil (still on medium-high heat). Add the carrots and celery and cook for roughly 2 minutes before adding the curry powder. Cook for about 30 seconds, just until the curry is fragrant then add the remaining stock (start with ¾ cup if you ended up with more after soaking the noodles), soy sauce mixture and bring to a boil. Add the drained noodles, shrimp and pork and cook on high heat until all the stock has evaporated, stir frying the entire time using a flat spatula to prevent the noodles from sticking to the bottom of the skillet. This will take about 2-3 minutes. Turn off the heat and stir in the green onions and sprouts into the noodles right before plating. Serve in individual plates or in a large platter for serving family style. Will serve up to 4 adults if being served with another dish. This will serve 2 as a main course and up to 4 if served with other dishes. 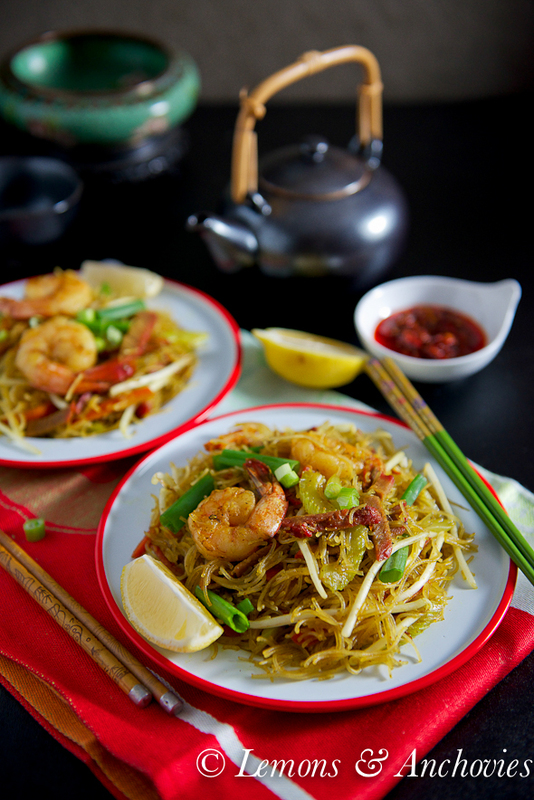 I’ve never tried Singapore noodles but I love curry so I can see why you love this dish! 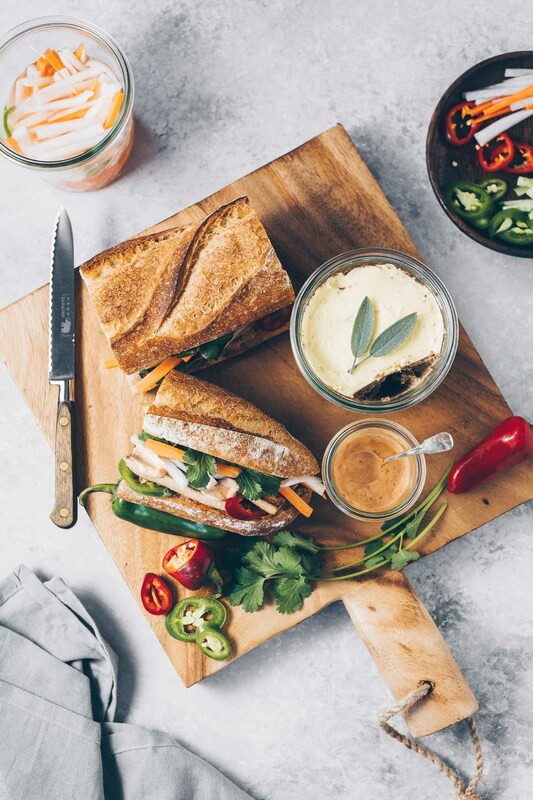 Colorful and extremely appetizing! The kind of food I crave all the time. mmm. 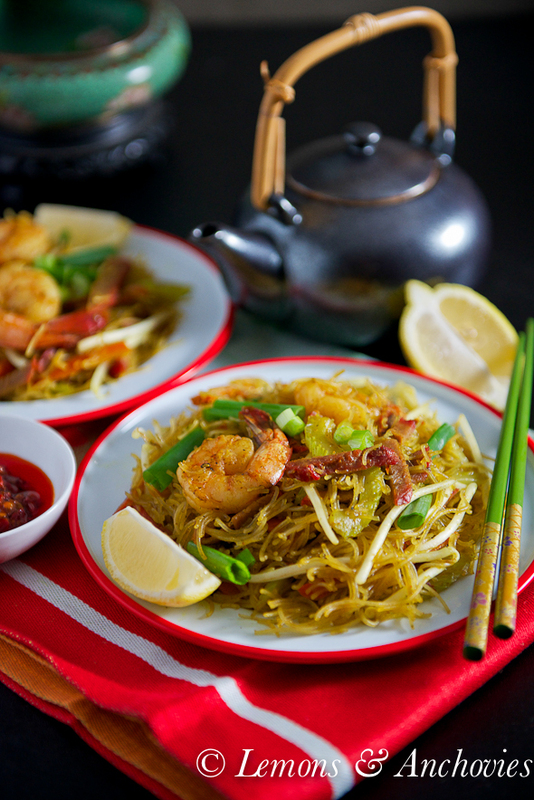 This looks so good and I’m allergic to shrimp and hate the clear-style noodles (the texture totally grosses me out). But you’ve inspired me to make something Asian style tomorrow! And I agree, I could eat pasta or noodles for days on end. My husband too. I love your photos, makes me want to just dig into the screen and pick up the chopsticks. I agree with you on how comforting noodles and pasta are. This recipe is terrific. Love your tip on soaking in broth, it reminded me of my mom’s cooking. Happy Thanksgiving, Jean! Gorgeous noodle dish, I love the flavors! I could eat pasta every day, pretty much! There are just so many different things you can do with it, it is hard to get tired of it! Your describe exactly how I felt whenever I ate noodles. My mouth is watering so much right now and we are hours away from dinner time. I also thought they did come from Singapore, thanks for clarifying that and your yummy recipe. Lovely, I think this is an Asian dish I wouldn’t be afraid to try. This recipe sounds great! I’m a huge fan of Asian dishes myself. For another great noodle recipe, check out my Cold Sesame Noodles post on MarkBegoCooks@weebly.com ! Ah, Jean, I see you share my passion for Asian noodles! I have never dared to blog about it, but I love Chinese food and have learned to cook it at home, as well as enjoying it out very often. In fact, if you did the math, I probably eat Chinese as often as I do Italian—but don’t tell my readers!!! Fabulous photo, by the way, just gorgeous.